Studio C is a sketch comedy television show created by cast member Matt Meese and BYUtv content development director Jared Shores. They envisioned an expansion of the popular Brigham Young University sketch comedy troupe “Divine Comedy.” They created a television show that would appeal to a national audience and that would offer something the family could watch together. Meese brought the idea to Shores at a time when BYUtv was expanding its programing. The first episode premiered in the fall of 2012. The name Studio C refers to the Brigham Young University studio where the show is filmed before a live audience. The show is directed by Craig Camp. The main cast members feature Whitney Call, Mallory Everton, Jason Gray, and Meese, all of whom are former members of "Divine Comedy." Supporting cast members Adam Berg, Stacey Harkey, Natalie Madsen, Stephen Meek, James Perry, and Jeremy Warner became main cast members with the fifth season. Studio C’s slot on BYUtv is on Monday nights and the show is broadcast via 866 cable channels, DISH Network, and DirecTV. BYUtv releases all episodes to the Studio C YouTube channel. 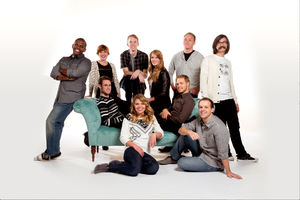 As of December 2014, the channel had more than 200,000 subscribers and 100 million views (as posted on Studio C’s Facebook page, December 10, 2014). The channel’s number one video, “Top Soccer Shootout Ever With Scott Sterling” has garnered over 16 million views on the channel and more than 40 million views across all media platforms. Other top favorites include “The Hunger Games Musical: Mockingjay Parody—Peeta’s Song” with over one million views. This page was last edited on 31 December 2014, at 02:15.